We saw California at Christmastime, but now it's summer! 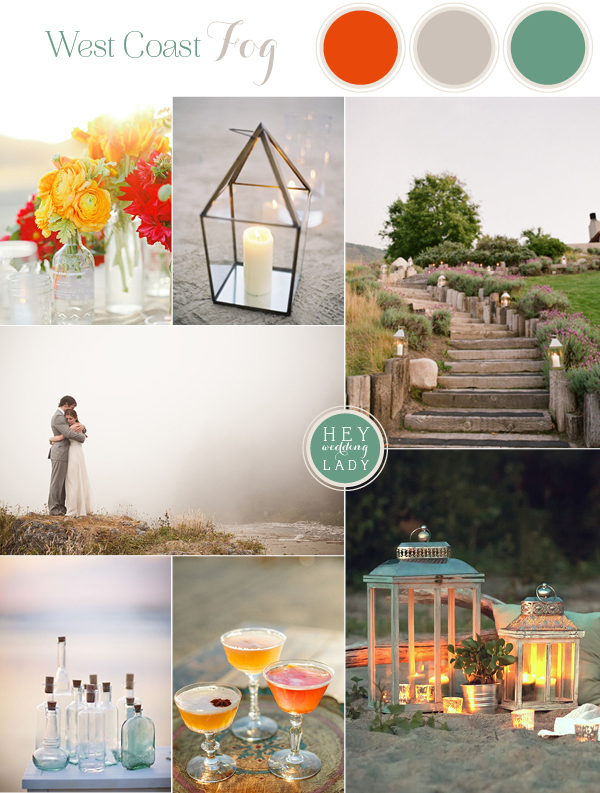 And I'm so excited to have my crazy cat mom/blogger friend Ariana of Hey Wedding Lady back here on Tidewater and Tulle to share some West Coast inspiration with us. From weddings to local summer happenings, she's got the Golden State down! There's a common misconception about the Central Coast of California - that it's always sunny, all the time. I can't lie, we do get more than our fair share of sun, especially during the spring and autumn, but there is a phenomenon here known as summer fog. In the summer months, most mornings dawn with a pearly gray cap covering the sun, slowly burning off as the day grows warmer. In the evenings, you can see it moving swiftly over the water, crawling steadily back in to claim the beach. It may not be the beach day that every visitor imagines, but it can make for the most enchanting pictures. I wanted to capture that warm, enveloping gray that is such a central part of summer on the Central Coast, and compliment it with the quintessential California cypress green, and sunshine orange. Santa Cruz Beach Boardwalk - A staple of my childhood, this is the must stop destination for tourists in the Bay Area! It's had a few facelifts over the years since this is the oldest operating beachfront amusement park in California. My favorite ride, the Giant Dipper, a historic wooden roller coaster has been in operation since 1924, and you can still hear rider's screams echoing across the bay! Monterey Bay Aquarium - Another favorite of mine! The Monterey Bay Aquarium is world famous for some of the most incredible sea life displays as well as a dedication to increasing awareness about ocean preservation. They have an amazing otter sanctuary, penguins (my favorites! ), and the most phenomenal Outer Bay tank, taking visitors to the center of the ocean. Point Lobos State Park - Point Lobos is quite possibly the best place to hike in the Bay Area. Trails wind through protected landscapes, over cliffs golden with lichen and through groves of the most beautiful, twisted cypress trees. There's something otherworldly about the view, which looks as close to Never Never Land as we're going to get without fairy dust. If you're lucky, it's the best place to see otters in their natural habitat, too! Nepenthe - This restaurant is legendary - not just for the amazing food and selection of local wine, but for the sweeping, panoramic views of the Big Sur Coastline. The best end to an adventure in the Bay is a glass of wine and one of their famous Ambrosia Burgers, watching the sun set over the coast as the fog creeps back in. Curious to see our Hampton Roads summer inspiration over on the West Coast?